You will never really know who you are until you have made a few mistakes. Believe me, I would know, because I have made a lot. My name is J.S. I am 17 years old and can now look forward to a bright future thanks to God, my family, and the Triangle Cross Ranch staff and program. About 4 years ago, I hit rock bottom after getting kicked out of four different schools. At home, I acted out and showed constant disrespect for friends and family members. At this time, I blocked out love, including the love of God. Although it was painful to leave home, I knew I needed help. 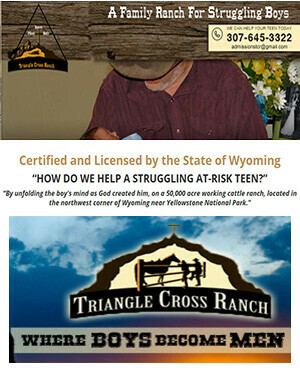 Triangle Cross Ranch offered me the help I needed and hope. I arrived in Wyoming a broken 14-year-old boy and departed a young, healthy 17-year-old, man. In the beginning, my disrespect and acting out continued. However, the ranch staff constantly set firm limits, enforced predictable consequences, and continually showed me how I was loved by God no matter what my behavior. The ranch program had all the right pieces of the puzzle to help me grow up spiritually, academically, physically and emotionally. Daily life consisted of morning Liturgy of the Hours, various ranch duties, home schooling, peer activities, and emotional support and guidance from the staff. Peer dynamics and team building skills helped me develop compassion, leadership qualities, and better all around social skills. My respect for adults and those in charge grew as I experienced the loving firmness of the ranch staff. Today, I look back and see how much the ranch has made a difference in my life. Now, I have an active prayer life, a plan to go to Junior College, good relationships with my family members, a profound respect for the ranch staff, and hope for a bright future. The hard work of ranch life, the beautiful countryside of Wyoming, and the spiritual approach to discipline used at the ranch changed my life. Thank you to my family and to the ranch staff for making this possible and for always believing in me! How can you ever sufficiently thank the people responsible for saving your son’s life??? This is the question I asked myself when pondering the impact that Triangle Cross Ranch has had on my now 17-year-old son’s life over the last three years. J. is our only son. In fact, he is our gift of life, given to us by God through an open adoption process at birth. He is our rose, simultaneously beautiful but containing thorns in need of pruning. At a profound moment of pain and desperation, a time when J’s aggression and outright defiance seemed too much to manage, Triangle Cross Ranch seemed the best equipped to prune back these thorns and nurture my defiant, 14-year-old’s broken spirit. At this time, despite our best efforts and the abundant love provided by friends and family members, J. seemed stuck in an endless “do-loop” of aggressive acting out and willful destruction. After four school dismissals, several bouts with the law, and a continual stream of angry outbursts, we finally made the tough decision to bring J. to the ranch. What transpired over the next three years was nothing short of a miracle! Initially, J’s defiant acting out continued. However, now, unlike in previous situations, J. could not get himself kicked out. To put it in his words, “the ranch staff just had a way of making disobedience unpleasant and still I had to do the work.” To me, this was key in his final acceptance and ability to look inward for answers in place of escape routes. Despite this firmness, God and love always remained at the center of all disciplinary efforts. Ranch chores, team building activities, school work, and prayers made up his regular daily routine. This structure proved to be a recipe of success for our son. Weekend phone calls between myself, my husband, T., J., and the ranch staff helped to reinforce all that was being accomplished. As time progressed, so did J’s maturity. By the second year, he was taking more responsibility for his actions and becoming a self initiator. By year three, he was functioning as a peer mentor and positive spiritual presence for many of the younger boys. Today, after completing his high school education at the ranch, he has walked away with tremendous skills, an active prayer life, positive self image, greater respect for authority, deeper love and appreciation for friends and family, and a plan for the future. In the fall, J plans on attending Northwest Junior College in Powell, Wyoming to study land management and welding. In closing, my husband, T., and I would like to offer a profound thank you to God and to the staff at Triangle Cross Ranch for loving, pruning, and nurturing our greatest of gifts. It is such a pleasure to see J. becoming the man God has designed him to be. This is Michael just letting you know how I’ve been doing since I left. I started football during the summer and I think I might finally be getting the hang of it. I’ll be playing running back on JV. Also, school started a few weeks ago. Even though I’m at a Catholic high school there are few kids actually practicing their faith but luckily I have found a good bunch. I’m very glad my school does offer daily mass for us, it’s been great in helping me keep up my spirituality. So, overall I have been doing great! I was a little worried that when I got home it would be hard to keep up my faith amidst all the bad influences of society in general but I’m glad to say it has only grown since I’ve been home. My name is Mike, I am 24 years old and a husband and father of a wonderful family. I am the oldest of 7 in a Roman Catholic family. As a young teen, I got into trouble much the same as all of you. My parents had a difficult time doing so but they knew that I needed help and so I was sent to Triangle Cross Ranch at the age of 15, in May of 1999. My first few months there were very difficult and I learned quickly how things worked and my place there. Some of my best years were spent in Clark, WY. I do not resent anyone or anything I came across there. It was at Triangle Cross Ranch that I learned who I was and what I was capable of doing. I learned to drive there, not only regular cars and trucks but heavy machinery as well. Having those skills have come in handy more than once. I learned about farming and agriculture, nature and hunting, machinery repair and upkeep. All of these things are invaluable. You may ask yourself when you would need any of those skills in the city, my answer is, you may never know. There is a growing lack of people who have these skills and they are highly sought after in city areas because of that. As well it’s not just the skill that is valued. Just put that on a resume and people see someone that is not afraid of hard work, someone who can learn just about anything, these skills are the root of what we are. Understanding the relationship between man and beast is incredible; too many people these days are caught up in strange beliefs and twisted values. Jerry and Mickey will steer you correctly, trust me in that. While I was at Triangle Cross Ranch I also learned how to fight. I know, I know, everyone who has been hit or has hit someone thinks they know how to fight, it is not so. Boxing is a lost art but is necessary. I’m not sure if it is still that way at the ranch as times change and society’s values change, but when I was a boy we resolve our issues through a form of good old-fashioned dueling. We didn’t use pistols but our fists. As crazy as it sounds I miss it, but lucky for me that’s the way we do it here in the Marine Corps, so it’s probably no surprise that it is a secondary job or mine. At my last duty station in Quantico, Virginia I was in charge of the Company’s (about 400 Marines) Martial Arts. I have taken a liking to fight and the Marine Corps Martial Arts Program. I am a 1st degree Black Belt, as well as an Instructor Trainer, which means that I train Marines to be Martial Arts Instructors. I don’t currently have any professional fights but that is something that I am training for. This is one of those things that I was talking about in regards to people telling you that you can’t so something. I, of course, didn’t listen. Many of the skills that I learned at the ranch have helped me in combat. Learning to adapt to a different culture just like you are now is one thing that allowed me to be successful in 3 combat tours to Iraq. As well as shooting and hunting skills definitely gave me a one up. You sure can’t beat the physical conditioning that working on a ranch gives you either. All of these things have helped me become successful but it doesn’t mean anything unless you can teach it to others. One thing I have learned in life is “it’s not about you.” In order for you to teach others, and this goes for anything, you have to fully understand and embrace it yourself. Once you accept your surroundings and embrace your situation you can exploit the opportunities that are presented. Bloom where you are planted, make the best of any situation and you will soon become unstoppable. Remember it is not about you, you must do these things for the greater good, whatever that may be, you just have to be patient. Patience, I cannot underemphasize that virtue by any means. In an age of instant gratification, this is lost. Patience will give you the skills necessary to deal accordingly with anything. Why am I telling you all of this, well it’s not about me, it’s for you. I remember being in your shoes and someone telling me things like this that has been in my situation would have put me at ease. This won’t solve all your problems and take away the difficult times but I hope it helps give you some direction. I am by no means perfect and I didn’t just become successful once I left Triangle Cross Ranch. I’ve had my share of hard times. Not to glorify it by any means but I still got into some trouble once I left Triangle Cross Ranch, and I can tell you the root cause. It was the company I kept. The people that you surround yourself with determine how you will act and what you become. This sounds crazy but reads “oh, the places you’ll go!” by Dr. Seuss, it is all right there. Anyhow, from experience let me tell you, your old friends are not worth it. People come and go quicker than you think. In the end, most everyone will look out for number one and leave you in the midst of the struggle. That means that you’ll be a loner more often than not, but hey, as it turns out that’s how a leader is born. When you’re alone in a cause and you’re the one who is different, people start to realize that and they are drawn to you. You’ll see when you go home, your friends will act like they miss you and they still care about you but only if you do what they do, they’ll want you to do the same old thing and they won’t respect you if you don’t. trust me they are not worth it, friends come and go. You want proof of that, really good friends that I have bled in combat with won’t even return my phone calls and have just dropped off the map. You can’t get a stronger bond than in combat and where are they now? It’s a harsh reality that we as leaders must face. I challenge you to embrace your situation, don’t take steps backward, stand tall and strong and move forward, people will begin following you and at that point, they look up to you. Make yourself accountable to someone, it will help. I have my family, and the thought of letting them down pushes me forward. But as I’m sure you’ve heard from boys in the past, it was the greatest experience and some of the best memories I have in life. There are truly too many memories to count. I wish I’d enjoyed it more as I was there instead of most of the time focusing on going home. Looking back, one of the greatest things I miss about TCBR was that it was out in the country so life sort of slowed down to where I could think about my life and get it in order. Definitely, I also miss the people and experiences I encountered while I was there. Of course, I am happy where I am at now with my family and everything, but some of the things I had there can’t really be replaced anywhere else. I cannot thank all of you enough for basically giving me back my life as God intended it. There is a lot of misery I would have experienced down the road if it weren’t for you all and my family. Know that I am forever grateful for all the time and energy you have given to help me and the other boys. I hope you always remember that you are doing a great service to help all the boys there as I can only imagine it might not always seem like it with some of the chaos that goes on there. I just want to let you all know that my life and family is back together due to you all. Thanks again and I look forward to hearing from…whoever? A Life Changing Experience for Struggling Teens, parents and the entire family.